Spooky stories about ghosts, ghouls and all things scary are some of the very best things about the world of the paranormal, particularly if we can capture footage of ghosts on camera. Sightings of ghosts aren’t all that unusual, but it can be difficult to capture a ghoul or spirit on camera, so luckily for you, we’ve rounded up 8 stories of real ghost sightings complete with photos to give you a real fright. You’ve definitely heard of Monet, right? 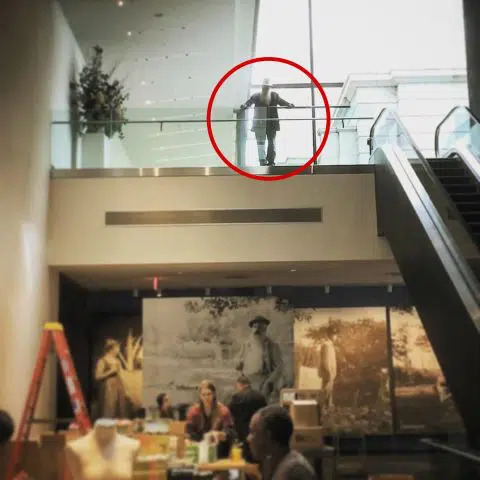 In one of the most interesting real ghost sightings we’ve ever come across, Monet was apparently snapped at the Cleveland Museum of Art whilst they were holding an exhibit dedicated to the French painter. The director of architecture at the museum was simply taking photographs of the interior and ended up snapping a photo of this rather snazzy looking chap, who bore quite the resemblance to Monet himself – perhaps he was returning to take a look around the exhibit. Of course, there was no one on the balcony at the time the photo was taken. Hospitals are well known to be spooky places, particularly at night. 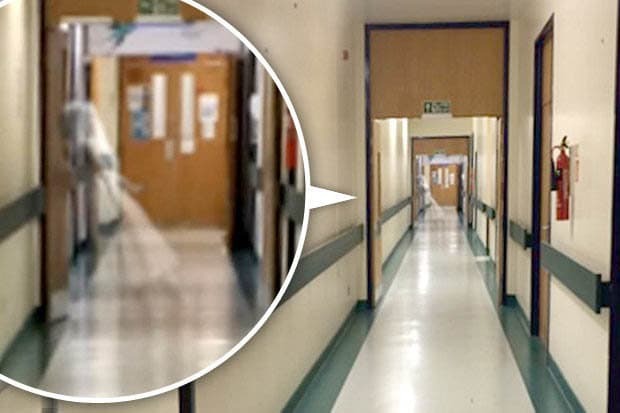 It might not be one of the most well-known ghost sightings UK, but this snap taken at Leeds General Infirmary by Andrew Milburn shows a nurse or a child fleeing into a room in a hospital corridor. He took the photograph as a way to simply show his girlfriend where he was in the hospital, as he worked there everyday, not knowing what the photograph showed until he viewed it more closely. Andrew had always been skeptical about ghosts, but seeing this figure changed his mind. Looking for more ghost sightings UK? This photo, taken by Michelle Widwinter in England, was simply a way for her to share an image of her new house with family and friends. 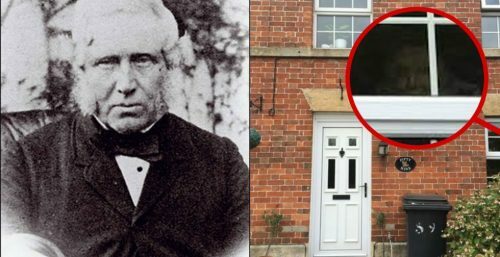 She’d gone outside, snapped a photo and returned to the inside of the house when she noticed the face staring back at her from the bottom right window of the house. When you zoom in, you can clearly see a nose, eyes and shoulders – the face of a man staring back at you. Michelle posted the image online and was eventually contacted by a historian local to her area, who believed that the apparition in the image could have been a man known as Old Man Kent, who was thought to be a murder suspect back in 1860. Initially, Michelle dismissed the image as nothing more than reflections and refractions of light from the flowers outside her window, but following further paranormal sightings and activity within the house, such as cold spots and lights flickering, it seems like Michelle is now a believer. A pregnant woman from Liverpool, Rebecca Melia claimed to have been able to see the ghost of her deceased mother in a baby scan. 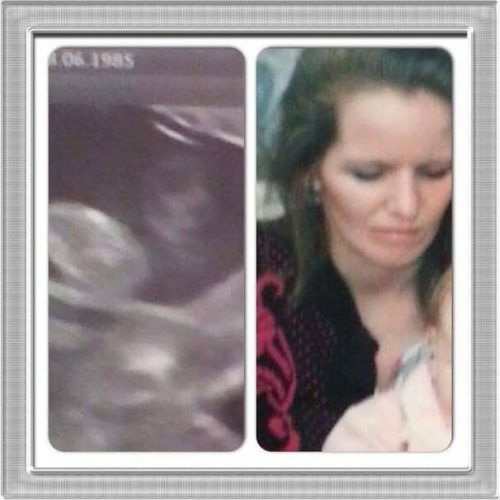 In one of the more unusual sightings of ghosts we’ve come across, when Rebecca had the baby scan photograph back and was able to take a little bit of time to look over the image, she immediately recognised the face of her mother to the right of her baby. Rebecca unfortunately lost her mother to kidney cancer before she fell pregnant after her mum had battled cancer for three years, and the family says they always feel the presence of Rebecca’s mother, even today. Perhaps one of the very best ghostly sightings caught on film is this spooky black figure by Simon Brown, qualified parapsychologist. He was spending the day at the old Galleries of Justice with his brother and was simply taking photographs of the building and gaol. Although Simon says that he didn’t notice anything whilst he was taking the images, when he downloaded them onto his computer, he noticed what appeared to be a black figure made of shadow that seemed to have walked through a brick wall. Staff at the Galleries have corroborated Brown’s story, saying that they too have seen similar figures and have experienced similar paranormal encounters, but have not yet been able to capture anything on film. Brown also mentioned when discussing the figure that it appeared to be in turn-of-the-century prisoner dress, dragging a leg behind him as though he was in chains. Sightings of ghosts aren’t always scary – sometimes they can bring with them feelings of peace or harmony. Unfortunately, this isn’t one of those stories. Kim Davidson was swimming in a lake with a friend and their combined three children. They took a photograph. So far, so normal. 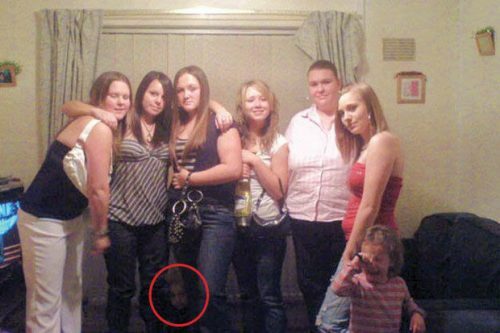 When the photograph came out, there was a ghostly figure of a girl behind the group, who looked like she was leering behind the family. It’s a scary image. 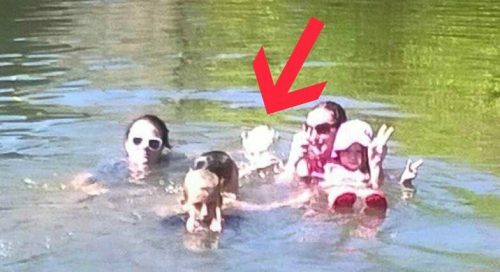 Once Kim saw the extra figure in the image, she contacted historians as well as paranormal experts in the community, and it’s now thought that the girl in the photo may be the ghost of Doreen O’Sullivan, a girl who died by drowning in the lake back in 1913. Ghost sightings often include children and this image is no exception. In this image, a group of friends pose together whilst getting ready for a party. A small child runs crying to the right of the image, and if you can just about see it, there’s a small child between the second and third people in the image. Apparently, the reason why the little girl at the right-hand side of the image was crying was because she’d felt someone push her in the small of the back just a few seconds before the image was taken, but of course, there was no-one responsible for pushing her. 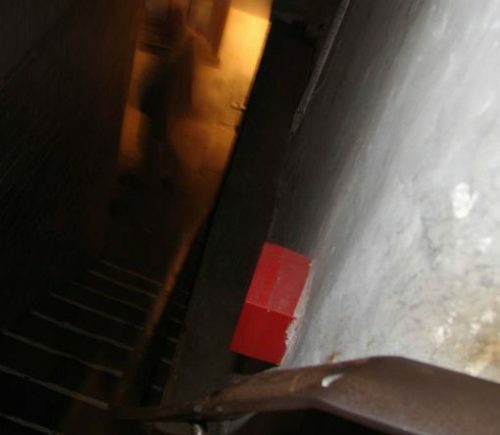 She’d originally been standing where the ghost is seen in the image, so it seems like the ghost had pushed her out of the way so that he or she could be seen. One of the more recent ghost sightings in internet history is this image collected by ghost chasers Toowoomba. It shows a husband and wife taking their first dance and it’s a lovely photo. But in the shaft of life to the right of the couple, there’s an image of a little girl who looks as though she wants to get in on the fun. 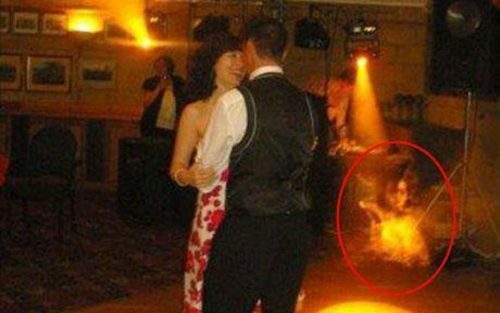 This is probably one of those rare ghost sightings where the whole sighting is relatively innocent, but we can never be completely sure. Ghost sightings are some of the best ways to spook yourself silly – one of my favourite ways to scare myself stupid is to throw on some Youtube ghost sighting videos, turn out the lights and grab the popcorn. Whether you believe in ghosts or not, some of the images captured on film and video are very difficult to disprove, so why not take a trip down the rabbit hole?